WebMD CEO Steven Zatz said the board is is open to a merger or the sale of all or part of the company, a move announced two months after its competitor Everyday Health was sold to J2 Global. The board hasn’t set a timeline for the process, and no decisions have been made, Zatz told investors during Thursday’s earnings call. “There can be no assurance that the exploration of strategic alternatives will result in a transaction,” he said. Zatz, a longtime WebMD executive, took over as CEO in September when David Schlanger stepped down. 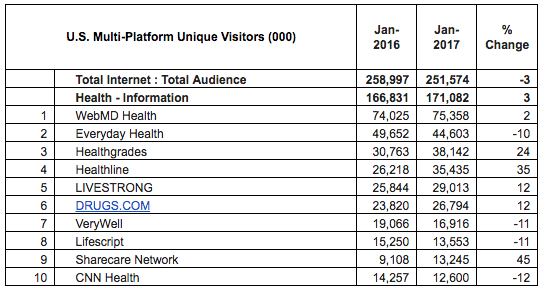 WebMD now expects a faster decline in the growth of pharma advertising in 2017 than it had originally anticipated. The WebMD network, which operates sites including WebMD, Medscape, MedicineNet, and eMedicine, reported that its biopharma advertising sales came in $20 million lower in the last few weeks of the fourth quarter of 2016. WebMD reported an 8% increase in revenue to $207.5 million in the fourth quarter of 2016, compared to $192.1 million in the same quarter in 2015. During the same period, the company reported a 7.4% increase in advertising and sponsorship revenue, to $171 million, compared to $158.3 million in the fourth quarter of 2015. It also reported a 11% decrease in unique users per month and a decline in Google search referrals. Zatz said the decline in search referrals was offset by direct sources of traffic. Drugmakers and their agency partners are acting in a more conservative manner, possibly due to pricing pressure, continued issues around managed care, and product launch challenges. Because of these factors, drugmakers are becoming more cautious with their budgets, reducing staff, lowering financial guidance, and delaying marketing budget decisions, according Zatz. The announcement also comes a week after J2 Global said it plans to divest the less profitable parts of Everyday Health’s business, notably Cambridge BioMarketing, a rare-disease agency, and Tea Leaves Health, an agency that works with hospitals. Kenneth Karpay, managing director of Desilva + Phillips, a financial advisory firm, said J2 Global’s divestiture plan makes sense, because the company plans to focus on healthcare media. The firm is not representing J2 Global in the divestiture.